Towering high above the frozen expanse of Dollar Lake stood a reminder that bigger isn’t always better. Positioned at both ends of an enormous 300 feet by 85 feet ice rink stood a pair of oversized hockey nets, each measuring 6 feet tall by 9 feet wide, that made the adult player standing beneath their massive arches look Lilliputian by comparison. Half buried in a snow bank behind one of the nets, Greg Roberts reclined in sheer exhaustion as he searched around for his water bottle. Roberts had just sprinted the length of the rink, only to lose the puck and give chase all the way down the ice again. 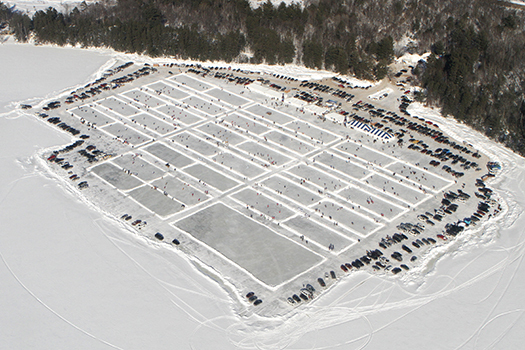 Imagine playing hockey on a seemingly endless sheet of ice. You can see the puck but no matter how hard you try or how fast you skate you are never able to catch up to it. Suddenly, you find yourself trapped at one end of the rink, helplessly watching as the play moves toward the other end. You struggle to catch up before exhaustion forces you to escape to the safety of the sidelines, only to await another futile shift of constant skating and little puckhandling. It’s no nightmare, but rather the reality that most 8 & Under hockey players deal with on a regulation NHL sheet. The American Development Model crew created a giant playing surface and built giant nets to show adult players what it's like for kids to play on a full sized rink. to see the full video. “It’s something else that just may click with another group of people that haven’t quite understood where we’re coming from,” said Ken Martel, technical director of the American Development Model, who came up with the idea of creating a video shoot to signify the absurdity of allowing young kids to play on the same sized ice sheet as an NHL player. Imparting the values of the ADM in a very real setting is a big step forward in the improvement of the quality of youth hockey. That’s why Martel brought a film crew to Eagle River, Wis., the home of USA Hockey’s largest adult tournament that this year featured more than 2,300 adult players, many of whom are also coaches and parents of younger players. 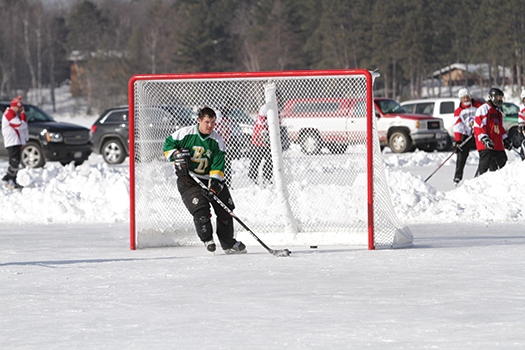 “I think the Labatt Blue/USA Hockey Pond Hockey National Championship is the perfect location and ideal scenery to make sure the ADM gets an opportunity to make some great points in regards to their program,” said Ashley Bevan, USA Hockey’s senior director of adult hockey. As the ADM continues to win over hearts and minds across the country, the regional managers are constantly looking for new ways to teach the importance of player development in age-appropriate settings. From this came the idea to supersize an ice rink to give adult players an accurate and similar experience of what it feels like for a young child to skate on a larger-than-life ice rink. 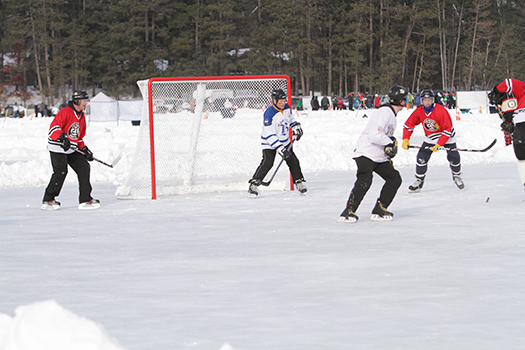 Mitch Wolf, a participant in the Labatt Blue/USA Hockey Pond Hockey Championship as part of the Russian Six from Madison, Wis., emphatically answered Martel’s question with a resounding ‘no’ after his team played a 5-on-5 game on the oversized sheet. A high level of disengagement is a major deterrent in youth players who find themselves bored with the outstretched version of hockey. To combat this, and to aid in athlete development across the board, the ADM encourages exciting and quick-paced small area games. After seeing how much energy is needed to cover such unmanageable distances, Wolf expressed the desire to spend more time spent with the puck to allow him to employ his skills. Adult hockey players were exhausted skating on a giant rink that ADM regional managers carved out on Dollar Lake in Eagle River, Wis.
Gosselin, a two-time U.S. Olympian with professional experience on both NHL-sized and the larger Olympic ice sheets, stressed the need to provide a fun environment that keeps kids coming back to hockey as they grow older. As he watched adults scrambling around the giant ice surface chasing after the puck, Gosselin pointed out that’s exactly how a Mite feels playing on a regulation rink. Brian Smith is the 2012-13 Brian Fishman Intern who is currently working at the National Team Development Program.